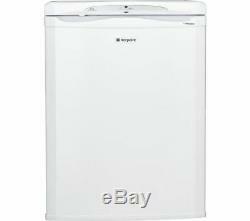 1 Undercounter Fridge - White. Kitchen Appliances > Refrigeration > Fridges. Brand new & pristine product. Store your weekly food shop on strong and durable glass shelves. Keep bacteria out thanks to the Hygiene Protection. Organise your food just the way you like with the Hotpoint RLA36P. With durable safety glass shelves, you'll be able to store whatever you wish without the worry of things being too heavy or getting in the way. Featuring Hygiene Protection, you can be confident any nasty germs will stay out of your fridge - ideal if you've got lots of fresh fruit and vegetables in the crisper that need to stay nice and ripe throughout the week. Use in outbuildings: This refrigerator is not designed to be used in an outbuilding both your food and the appliance can be damaged. Do not use it in any unheated area. Reversible door hinges: This appliance has a reversible door. Please consult Team Knowhow or a qualified installation expert to carry out door reversal - select the door reversal service when you add this product to the basket. All Currys/PC World Outlet guarantees are non-transferable. Manufacturers guarantee: 1 year labour, 10 year parts. Annual energy consumption: 119 kWh. Type of door handle: Integrated. Climate class: SN - T. Optimum ambient temperature range: 10 - 43°C. Noise level: 42 dB(A). Colour / Finish: Gloss white. Number of salad crispers: 1. Number of door compartments: 4. Storage features: Egg rack x 1, Bottle balcony, Dairy compartment. Reversible door: Yes, kit required - hinged on right. Please consult a qualified installation expert to carry out door reversal. Recommended installation space: 5 mm to the sides. Dimensions: 850 x 598 x 620 mm (H x W x D). Boxed dimensions: 900 x 670 x 700 mm (H x W x D). Boxed weight: 35.1 kg. This product has no reviews yet, however see what our buyers say about our other products..
Just get in touch and one of our friendly, dedicated team will be happy to assist. We'll reply within 24hours (Mon-Fri, 9-5, excluding Bank Holidays) and do our best to help! Collections direct from our warehouse are not available. Christmas, Easter & Bank Holiday deliveries. If you can't find the answer to your question above, please refer to our "FAQ's" section by clicking here. We're here to help! Where can I return a product? Following The Consumer Contracts (Information, Cancellation and Additional Charges) Regulations, we will accept items back even if you have opened the goods to inspect them. Whilst the goods are in your possession you must take reasonable care of them. In an as new condition - in the same condition as supplied to you - complete with any accessories and free gifts offered with it. In all cases we reserve the right to inspect the product and verify the fault. We do not cover faults caused by accident, neglect, misuse or normal wear and tear. All non-pristine large appliances come with 3 months waranty. The above warranties do not cover non-faulty products, nor issues caused by accident, neglect, misuse or normal wear and tear. Please note - we do not stock spare parts, and are unable to send replacement parts. You received an incorrect item - you received a damaged item - you received a faulty item. Can a Currys or PC World retail store help? Reassuring 12 month guarantee on all products. 1 Undercounter Fridge White" is in sale since Monday, October 8, 2018.